The wait for a new high-quality option for your construction documentation is over! Our partner Ricoh just announced their new flagship 360° camera “Theta Z1” that is supposed to ship in late March 2019 and it is a huge step forward in almost every aspect. While it might not be for every jobsite due to its nearly $1,000 price tag, we think there is great potential for the larger jobs out there, and here is why! Highlights of the new Ricoh Theta Z1 360° camera for your construction documentation at a glance. 23-megapixel resolution paired with larger sensors increase the overall image quality and result in more details — especially in low light situations. A new magnesium alloy body brings more robustness, yet easy handling while retaining a slim profile. The new OLED display lets you identify relevant shooting and camera status information at a glance. A variable aperture allows for high-quality images in various lighting situations. Many enhancements under the hood that build upon the great foundation of the predecessor model Theta V.
For us at HoloBuilder, the most important aspects in a 360° camera are ease-of-use, capturing speed, and of course image quality, and we are excited to see that Ricoh continues to improve all of them with their latest model. Read on to learn in detail how the five highlights can take your Reality Capturing to the next level. Larger sensor size delivers a better overall photo quality which translates to sharper images with more details. The Ricoh Theta Z1 is equipped with a pair of 1.0″ back-side illuminated CMOS sensors, which are some of the largest found in consumer-grade 360° cameras. The camera also offers a higher resolution of 23 megapixels, which results in more detailed photographs and enables superior noise reduction performance. This is especially useful for indoors shots and in other low light situations. Thinking of typical construction site conditions, you can often find yourself in rooms with subpar lighting. Here, the Theta Z1 shows its strengths by presenting impressive details even in dark situations. The camera body has been re-designed from the ground up and is constructed out of a magnesium alloy that not only feels nice but also adds to the overall robustness of the camera. With this sturdy metal frame, the camera now feels like a proper tool that is perfectly suited for rough days on the construction site. But even though the camera now houses much larger sensors, Ricoh managed to keep the overall camera size small enough to easily fit in a pocket. Since the small body allows for a very small distance between the two lenses this allows for a better stitching performance with fewer parallax errors which again leads to more seamless photos with better overall quality. The Ricoh Theta Z1 comes with an OLED display that shows shooting information such as battery level, shooting mode, and the remaining number of photos. OLED displays offer higher contrasts than traditional LCD displays which will be of advantage when trying to read it outside in bright sunlight. This comes in handy when you want to do a quick equipment check before a job walk, and now you can see all this information at a glance. There is also a new function button at the side of the camera which lets you switch between shooting modes, and more importantly, lets you switch between installed plugins. On older models you needed to select the default plugin on a computer or mobile device with the Theta App, now you can do so on the camera itself. The camera can take 23-megapixel still images just like its predecessor, but with a higher resolution of 6720x3360 pixels which equals 7K. Its newly designed lens now has a variable aperture (f/2.1, f/3.5 or f/5.6) that can be opened up or closed down depending on the lighting situation. By doing so more details will be retained in low light on the one hand and colors will be less washed out bright lighting on the other hand, which often occurs when natural light comes in through windows. The resulting more detailed 360° photos retain more information, which can be valuable when it comes to reading signs and other small details. All of this makes it easier to check the construction progress on your desktop or mobile device. Along with the body redesign comes a newly developed lens unit which reduces ghosting, flare, and purple fringe, which all improves the image quality. The Ricoh Theta Z1 comes with 19GB of built-in storage for about 2,400 photos (JPEG), so you can shoot a large number of high-quality construction photos without running into storage capacity problems. Better ISO sensitivity of 80 to 6400, which allows the camera to better adapt to extreme lighting situations. Several different shooting modes are available and can be selected on the camera. The camera runs on a new Qualcomm chip and features improved overall performance, meaning it should power on even faster. It is possible to save the 360° images in RAW format, which allows for even more detailed photos and flexibility in post-editing. Plugins that can be installed directly on the camera’s Android OS, alongside a new “time-shift” plugin that allows photographers to remove themselves from their photos. Great in-depth video review of the Theta Z1 by camera expert Mic Ty from 360Rumors. 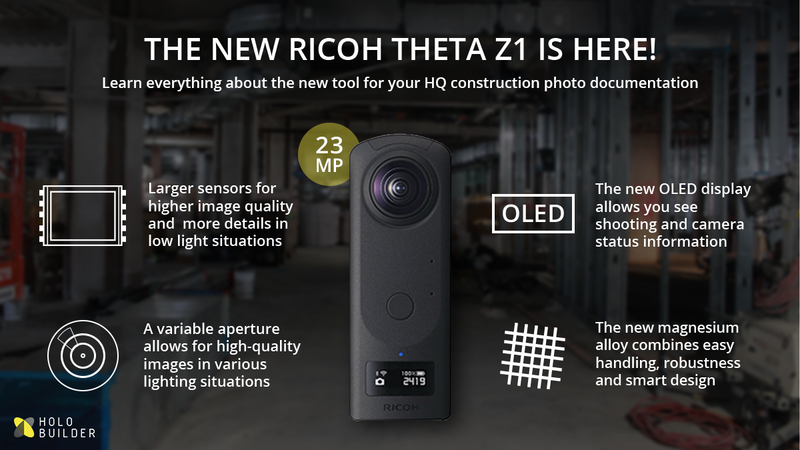 To sum things up, the main reasons as to why construction professionals will love the Ricoh Theta Z1 are all about better image quality with the same efficient workflow that you already know and love. Ricoh managed to improve on many of the most important features for construction progress tracking, all while keeping the camera small and easy-to-use. And there will be a lot more features and functions to experience when the Theta Z1 will ship in late March according to what see right now. It comes at an RRP of $999.95 and you can sign-up at Ricoh’s website or pre-order via Amazon and B&H. What do you think about the new Ricoh Theta Z1 360° camera for your construction documentation? We’d love to read your thoughts! Also if you would like to suggest an addition to our supported cameras, features or integrations that would make your life much easier, please send us an email to buildingtogether@holobuilder.com. It's All About 360° Reality Capturing for Construction Teams.